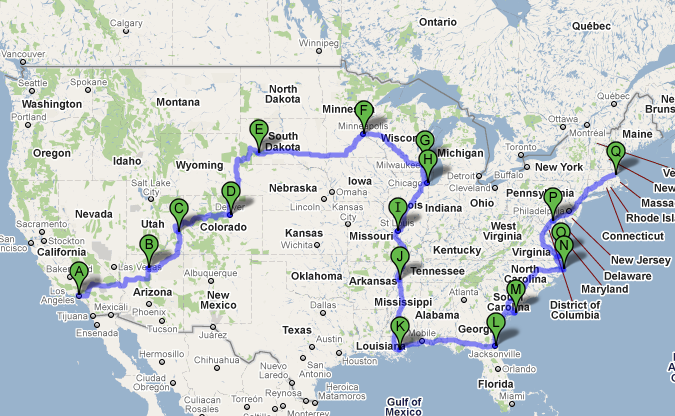 A rough map of where I'll be road tripping this month! So the semester is officially over, and I’m out of Boston and back in Los Angeles. I wanted to let my readers know that I’ll be taking a bit of a hiatus for the rest of the month. I mentioned this earlier in the year, but starting this Sunday, my friend Alex & I will be spending the next few weeks driving across the country. I’ve started another, separate blog to document our travels, where I’ll be writing about our day to day experience and posting pictures, so be sure to check that out! In the mean time, enjoy the month & I promise I’ll be back in June with lots of fashion posts!